I am not a baker. I don’t like it, I am not good at it. I am not a fan of having to follow a recipe to a tee. I am an improviser if you will. But fall is here, and I bought some amazing, fresh, local cranberries, and my dad’s wife had this amazing sounding recipe, so I thought I would give it a try. Everything was going well, and dare I say it, I was enjoying baking. Then it happened. I cut my fingernail right off with my mandolin slicer. Ryan is always telling me I cut things way to fast and carelessly, and I always dismiss him to later appear with several band aids. Well this one hurt. This one gave me a hot flash and brought me with in an inch of passing out. So the baking plan was put on hold as Ryan squeezed my finger for an hour and I sipped OJ. 3 hours later and I am starting to feel better and ready to tackle this baking thing again. Luckily, nothing in the kitchen was polluted. I washed off my mandolin (which some how did not get polluted either) and continued with my pear slicing…very slowly and carefully. The next obstacle I incurred was the crust. Crust is the main reason I do not bake. So I cheated and bought Trader Joe’s pie crust, thinking this would make things easier. WRONG! It was crumbly from the start, and I was lost as to how to place and seal the top crust. But I fumbled my way through. I placed the pie in the oven, and checked it after 12 minutes to see if I needed to cover the crusts so they wouldn’t burn. I did. I spent the next 30 minutes trying to figure out how to cover just the outer crusts with tin foil. I burnt my hand in 3 places, and dropped plenty of “pie gunk” on the bottom if my freshly cleaned oven. I finally shut the oven, said screw it, and set the timer for 30 more minutes. Whatever happens happens. 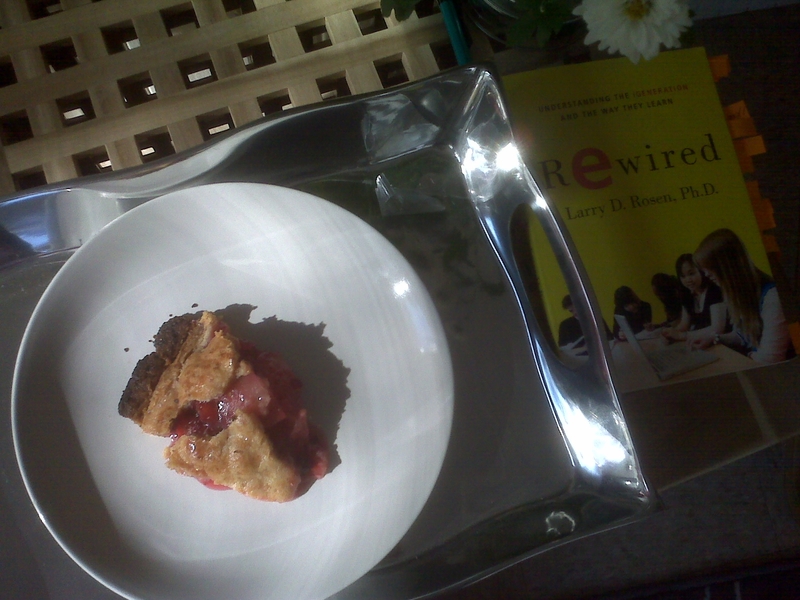 Well, to my surprise, the pie was delicious! The flavors were a perfect balance of sweet and sour, the pears cooked to the exact consistency I wanted them at, and the crust was flaky and yummy! I may or may not have eaten 2 pieces instead of lunch! So, was the outcome enough to make me want to tackle baking again? Perhaps, but I will need some of those cut-proof gloves first! I think I will try a cake next time, they seem much safer! 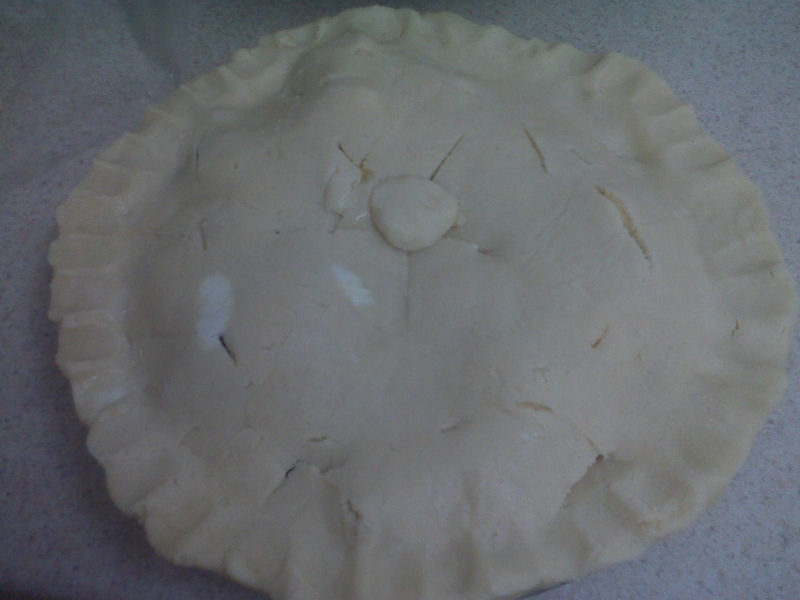 Bake 40 – 50 minutes until golden brown – Check the pie after 12 minutes, if edges are starting to brown already, cover them with foil so they do not burn. When pie is done baking, brush glaze over the crust while the pie is still hot. 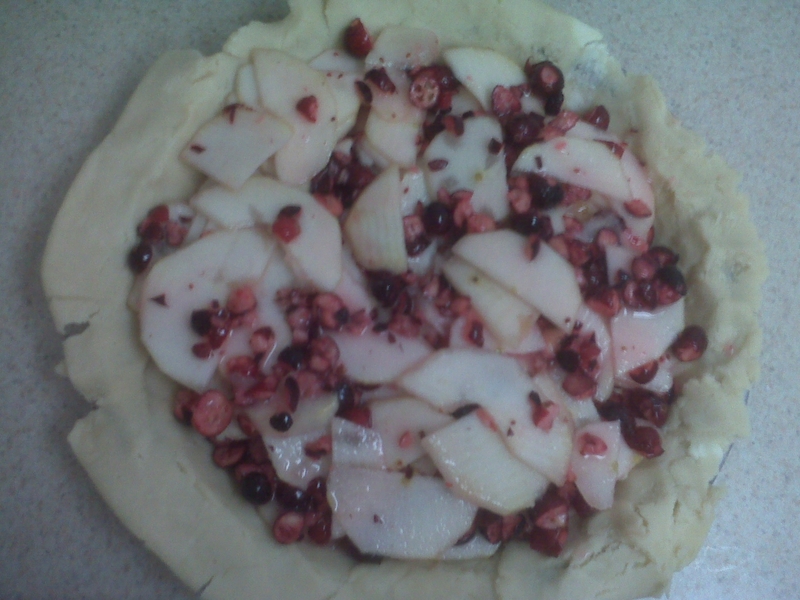 This entry was posted in Recipes and tagged baking, cranberries, cranberry recipe, fall, pear, pear recipe, pie, pie recipe, recipe, thanksgiving pie by reneeh. Bookmark the permalink. Ack I would have passed out if I cut myself with a mandolin :p Hope you’re feeling better. This pie sounds AWESOME! Great job. Yeah, I left details out, but I actually did pass out! They actually have pie shields at the store, it is a circle that sits on the edge and keeps the crusts from burning. I use them all the time. Awesome! Thanks Michelle! I will definitely be going to get these since I now have requests for more pie! You did a wonderful job with this and I sure would love to share to Foodista readers this post if you wont mind.Just add your choice of Cranberry widget at the end of this blog post and it’s good to go.Thanks! Awesome! Thanks Alisa! I will add the widget now. Glad to hear the pie was delicious! 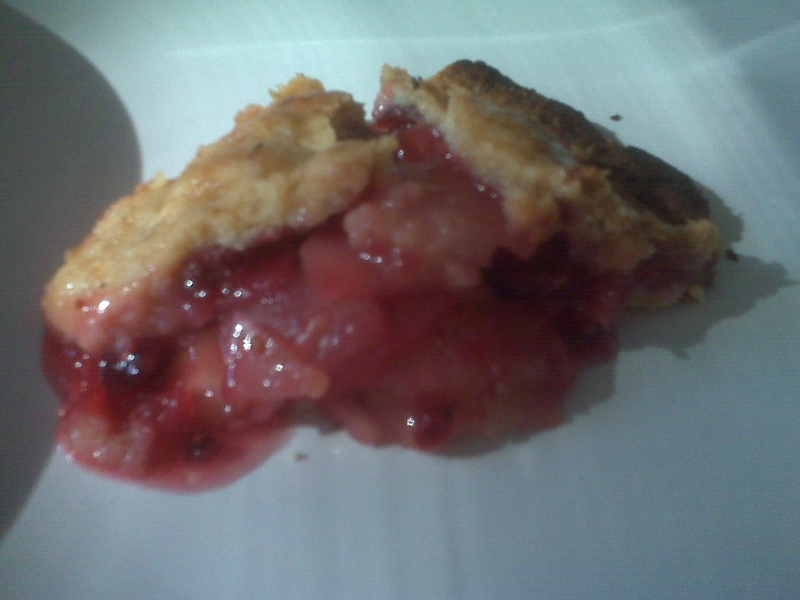 I’ve never made a pie before, I’m too intimidated by making a good crust. Yum! Good Recipe. I am making a cranberry pecan torte tomorrow- I love cranberry desserts this time of year so I have definitely going to have to bookmark this recipe. Thanks Rhandi- I saw a great cranberry tart recipe on http://www.dovesandfigs.com that I think I will tackle this week! Let me know how yours comes out! 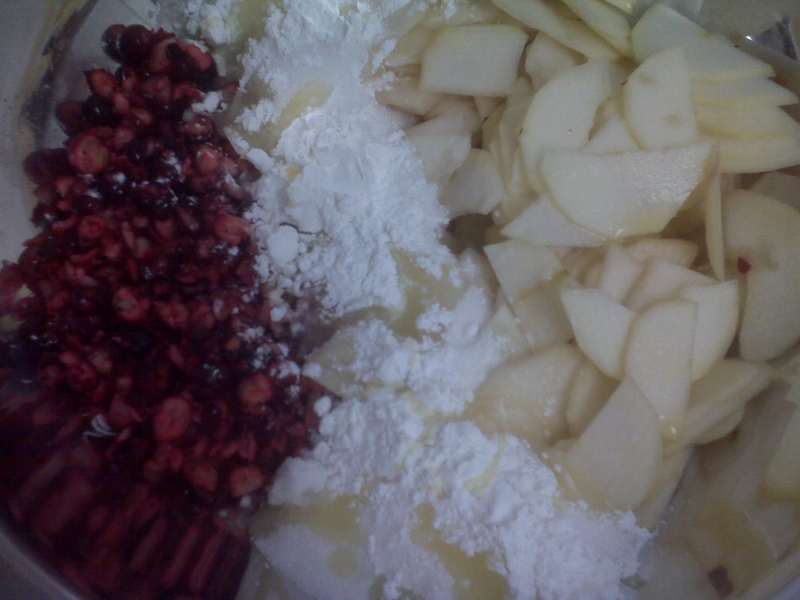 Pingback: Cranberries Three Ways! « Eat.Live.Blog.